Northeast Ohio native Robert Spano—Grammy Award-winning music director of the Atlanta Symphony Orchestra and Aspen Music Festival and School—joins seven internationally renowned guest conductors for Cleveland Institute of Music Orchestra concerts during the 2018-19 school year, the school announced today. “To have secured this level of talent – conductors who lead artistically significant orchestras and hold prestigious positions at institutions of higher learning – for the 2018-19 school year is a real testament to the Cleveland Institute of Music’s reputation as an extraordinary training ground for orchestral players,” said Chief Academic Officer & Dean of the Conservatory Dr. Judy Bundra. 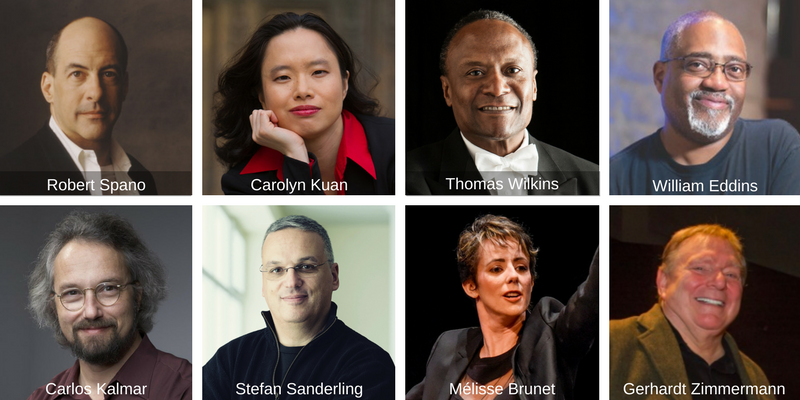 These eight guest conductors join a list of luminaries who have conducted and coached the CIM Orchestra in recent years, including JoAnn Falletta, Michael Tilson Thomas, Jahja Ling and Brett Mitchell. All concerts are free and open to the public; some program and ticket information will be announced at a later date. Photo credits: Robert Spano by Andrew Eccles; Carolyn Kuan by Steven Laschever; Carlos Kalmar by Michael Jones; and Mélisse Brunet by Karen Almond.